Today was a lovely day in the garden. I completed some trimming and deadheading chores and then strolled around the garden. New colors are making their presence felt. Let me share just a few of them. These are all members of the ‘Endless Summer’ family of hydrangeas. Although all of them were rather severely damaged with a late frost, they are able to flower on new wood and are loaded with blooms. 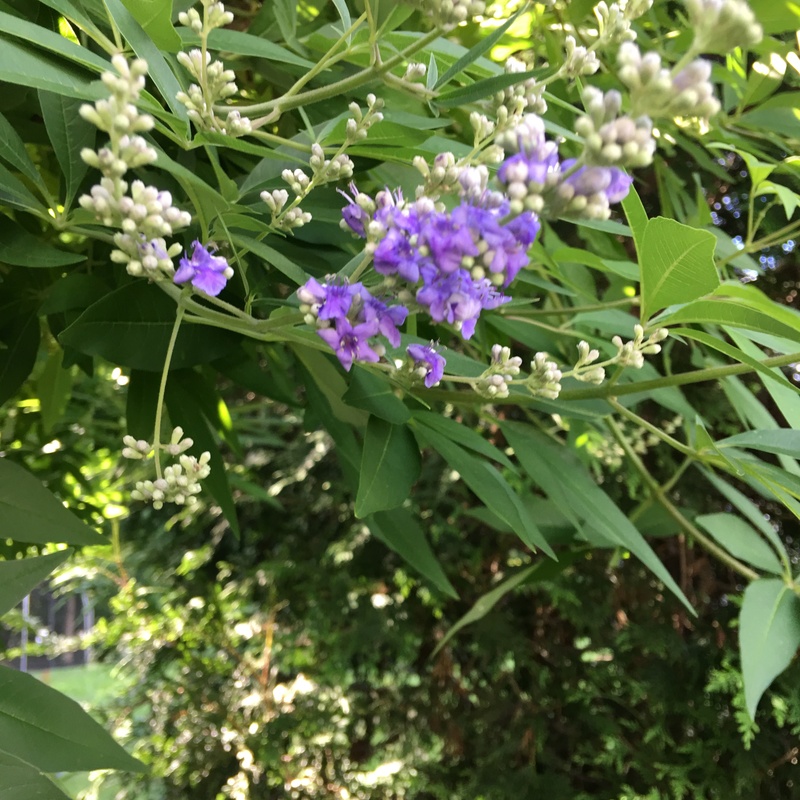 I am very excited to see the first lavender blooms on my vitex. I expect to see armies of bees in the near future. I cut back my three vitex trees rather severely over the winter, and they are bounding over with new growth. It’s going to be a good season. More color is coming now from Society garlic, an annual Mandevilla vine, and the first coneflower this year. This entry was posted in Gardening and tagged Daylily Early Red, Hydrangea Blushing Bride, Hydrangea Endless Summer, mandevilla vine, Society garlic, Twist and Shout hydrangea, Vitex agnus-castus, White Swan coneflower. Bookmark the permalink. Very lovely. Thank you for sharing the beauty of your garden. We did nothing special except prune out dead wood, and these are about as nice as they have ever been. Thanks. I can’t figure out if my hydrangeas bloom on old wood or new. They simply don’t. Yours are lovely! When we had the drought and heat, my hydrangeas kind of gave up, so I had no choice by replaced it with something else. 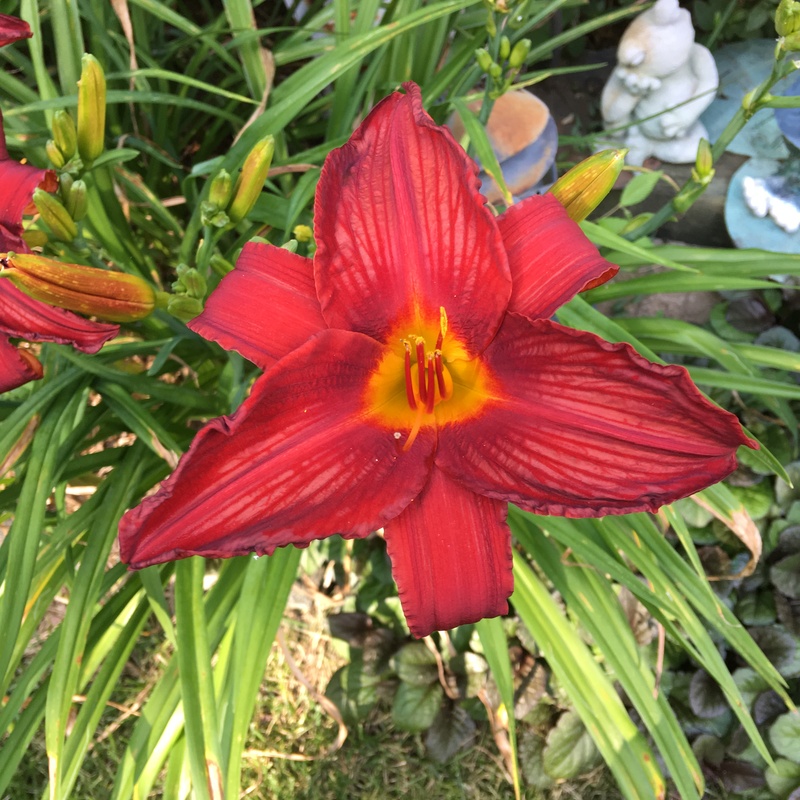 I have daylily also, same color. BTW, I made a slight change of the site link. The old link is now Inactive. If you’re not following me, please ignore this message. To have my new posts come to your Reader – copy and paste my NEW link and paste to your Reader – Blogs Followed, click on the blue Follow and it will turn green and change to Following. Then my new posts will come to your Reader. Thanks, Miriam. I have lost a few hydrangeas over time as well. Yes, I replaced it with bushes that at least have leaves in the winter! Beautiful hydrangeas, love the blue ones. It is a special color this year…seems to be a deeper blue than in the past. Society garlic – sounds interesting! I need to look that up. It has been reliably cold hardy here for at least two years, but I suspect it might be dicey there. Perhaps in a pot? Flowers are lovely.I have’nt seen some in my life!! Thanks. I’m glad you like them. Thank you, Christina. And I’m happy too. This has been a surprisingly good year for the hydrangeas. Your Hydrangeas are always so lovely, John. Thanks for sharing!